I have a damp patch on an exterior wall and I cannot find the cause. Its driving me mad. The house is newly built and I moved in March 2008. The wall is coated in K-Rend. 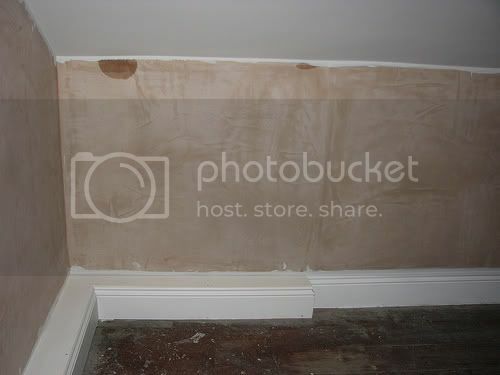 I have a damp patch on the bedroom wall up near the ceiling and one half way down. Ihave been up in the loft and the chimney is dry all round, their are cowl's on the chimney pots to help stop the rain entering. How can the damp show through such a long way down from the chimney? On new years day we discovered 2 damp patches on the wall where the wall meets the roof in the room that's built into the roof. These disappeared within a few days, then reappeared a few days later. Is a damp patch on the exterior surface of a brick wall a cause for concern? its on the extrior of the flat below mine. it on the wall where there was once a chimney breast long removed. (we looked at both flats and went for upstairs one the wall has a patch that looks like its had some work done before (black mortar) should i be concerned? I've noticed that I get a fair bit of condensation on the windows in my 3 bed end terrace house bedrooms. We have the heating on for 2-3 hours in the morning and then for longer in the evenings. At the moment there are no vents/airbricks that I can see so I was thinking of installing a vent into the ceilings of the bedrooms that would go into the loft space. I wonder if someone can help. my mum's got a damp problem which she's asked me to fix. Now, I can do general DIY around the house but have no experience of damp, i've taken lots of pictures which i can send out. I live in a two bed garden flat in London, which is the bottom half of a converted terrace house. I have a big problem with condensation in two rooms in the house with water running down the windows and doors and gathering on the woodwork and even dripping from the windows onto the floor and waking us up in the bedroom. Looking for a bit of advice. Bought my house about a year ago and since then I have noticed patches of black damp forming in the upstairs rooms and around the doors downstairs. The bathroom is the worse effected. The mold will appear on the roof, around the windows beading/wall contact, around the bath (around the sealeant / tiles). We also have it in the bedrooms, mostly appearing in the upper corners. In our upstairs bedroom we have a nice bay window looking out along a straight road to a tree lined river, and beyond to farmland and hills. Lovely!